Supplied as silicone fittings attached directly to silicone tubing or hose, AdvantaPure’s Molded Silicone Assemblies are well-suited for applications involving aseptic transfer, sterile processing, and other critical applications in the pharmaceutical, biopharm, and high purity industries. The assemblies reduce installation time, improve cleanliness, and retain the many benefits of silicone. Full BPOG standardized extractables test protocol has been performed on the silicone tubing and fittings by a fully-accredited, third- party test lab. Molded Silicone Assemblies are not intended for implantation or continuous steam applications. Molded Silicone Assemblies are available from AdvantaPure in mini and standard Tri-Clamp® fitting styles and are supplied with male gaskets molded directly to the face of the fitting. 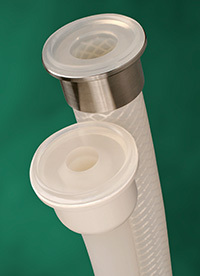 Straight-through configurations are produced in sizes up to 1" tube I.D. Protective backup cups, offered in polysulfone or series 304 stainless steel for extra durability, provide a stable clamping surface and safeguard the fittings during installation and use. All assemblies are custom made to best meet each application's requirements and incorporate either unreinforced silicone tubing or braid-reinforced silicone hose. Working pressure ratings vary depending on product. Call AdvantaPure today to discuss your needs. Single-use Molded Manifolds provide a seamless transition between tubing and connections for a continuous, leak-proof flow. Molded connections include Y, T, cross, reducer, Tri-Clamp®, and mini Tri-Clamp styles. Made from AdvantaSil platinum-cured silicone, they allow for one material contact surface throughout the system. Connection sizes vary depending on style.